Pictured are some of the hundreds of boxes of books that arrived in May in the 2018 shipment of 13,000 books to restock 12 libraries in Uganda and organize 1 new library. Boxes were ready for schools to collect! Before leaving Texas, a school name is placed on each box, and it is marked as Easy, Fiction, or Non-Fiction. Each book shipped has a Dewey spine label, plus pocket and card for borrowing. Cheers for faithful volunteers in Texas and our many supporters. These kids were happy to receive 500 new books for their library. It’s part of the continuing commitment Libraries of Love has with all of the schools that receive libraries. Loved finding these kids with their class borrowing books at Buganda Road Primary. Another class was waiting to come in. Library time at Bat Valley Primary. I enjoyed time with second and seventh grade classes. We had a great time Skyping between Namirembe Primary in Uganda and Forest Creek Elementary in Texas. The kids loved it. Each group had prepared questions to ask. Smile and more smiles! (June 2, 2018) – Much singing, dancing, laughter, new friendships and learning took place the last two days as our 40 Libraries of Love librarians met in Mbale. A special treat was having our Kenyan librarians join with our Ugandan librarians. We are a family. Great meeting! (June 10, 2018) – Great time today at the launching of Cathy Kreutter’s two new books, ‘Amina’s Choice’ and ‘The Rock and Roll Rolex.’ (A rolex is like our breakfast taco. ) Two of Cathy’s books, ‘Nitendo’s Wish’ and ‘I Know a Mzee (old man) Who Swallowed a Fly’ are on our Libraries of Love Amazon Wish List. Cathy has lived in Uganda 30 years. Her books have many words in the children’s native language, as well as pictures with Ugandan settings. Great books! Great team work resulting in a beautiful library. 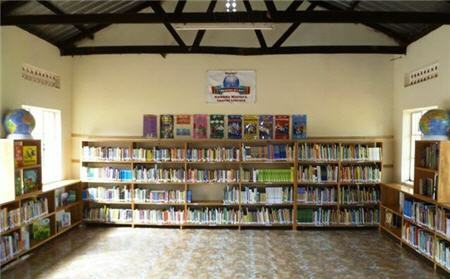 Namatala Laurel Library was our second library, established in 2006. Libraries of Love restocks each library at least every three years. (July 7, 2018) – We had an awesome Libraries of Love HM / principals’ meeting. Principals learned how to use the libraries to their fullest potential. Two groups that won our high school reading competition presented. One presented Romeo and Juliet. The other group shared a travel brochure they created about Kenya. Two were dressed as Maasai. Some of our librarians presented good / bad librarians skit. Great day. Very worthwhile! In 2017, seven libraries were supplied for schools in Maasai land, Ngong Hills, Kenya. Each school is remote, at least 1 1/2 hours from a main road. The schools are not located in towns. They are located in what is referred to in Africa as the “bush.” Through the books, the world will open to these students. In the non-fiction they will see people from around the world of different cultures. Many of the non-fiction books correlates with the students’ curriculum, but with beautiful pictures and interesting text. Executive Director Trudy Marshall met with all the librarians and principals for training while she was in Kenya. Education officials came to meet with Trudy to offer their thanks for the work of Libraries of Love. In 2018, Libraries of Love is hoping to bring the Kenyan librarians to the two-day training session that is held annually for Ugandan librarians. Class in the library showing off their new books. Thanks to a special Amazon purchase program created for Libraries of Love by volunteers Jim and Ellen Matthews, each school received 52 African themed books. There aren’t words to describe the expressions on students’ faces when they first see their library and are given books to read. They totally forget we are there. Love watching their excitement. Amazing day with the team in the Masa Mara in Kenya. We arrived just in time to see part of the great migration of wildebeest swimming the Mara River from Tanzania into Kenya looking for grass. What a great team! It is hard to imagine the work involved. This team definitely did their part – working quickly and tirelessly. They laughed and joked even when conditions were hot and dirty at times . They are pictured with our favorite safari driver, Naser. Thirteen existing Libraries of Love libraries were restocked this summer with thousands of books, and one new high school library was created. Many thanks to the incredible 2016 team for their hard work and for taking time to share their love with the students. The “mzungu” parade through the villages to visit sponsored students’ homes will never be forgotten. The huge smiles said it all. The volunteer team arrived Sunday. Took them to Endere Outdoor Theatre in the evening. There were dancers from each part of Uganda, and a comedian, as well. Wonderful evening! In reflection, I simply shake my head and think – incredible. As we have provided libraries the past 9 years, the administrators have constantly commented on the difference reading has made in concentration, expanded vocabulary, improved writing skills, and general knowledge. Abraham Lincoln once said, “The things I want to know are in books. My best friend is the man who gives me a book I haven’t read.” The books are changing lives, but the continued friendships and love that are shared through LOL are changing lives as well. Since 2005, Libraries of Love has opened libraries in 23 schools in Uganda, including this one in 2010 at Ugandan Martyrs Primary School. Our libraries now serve about 30,000 students.